Just wanted to share a little bit of what I've been up to lately. (I know it's not stamping.....but bear with me!) I've been making these burp cloths for a while now, mostly for people I know who are having babies, for shower gifts and such. I just love making these burp cloths, and LOVE picking out and playing with the fabric and all the wonderful colors and patterns, just like I love paper! I also tried to make little "drool" bibs in matching fabrics, and am backing them in minky. They are super cute. I have seen similar products for sale in little boutiques, and I cannot believe what they are asking/getting for these! It's amazing!I thought that I might sell the ones I make at way more reasonable prices, and see what happens! I've sold a few sets to some people that I know, and decided to just put up a little site to show what I have available for purchase. If you would like to take a peek, you can check it out here. I am still getting things set up, so pictures of everything I have are not up yet, but hopefully in the next couple of days it will be! I'm always excited to see where new adventures take me. If nothing else, I will continue to keep making these for family members and friends and their new additions! Wow. I didn't actually think I would have another post this soon! I have to say I am a bit pleased with myself! But I got Kellan down for a nap, took a shower, which was much needed after almost 3 days, and since the other 3 boys are still at school, I wanted to try to get this card posted that I made last night. 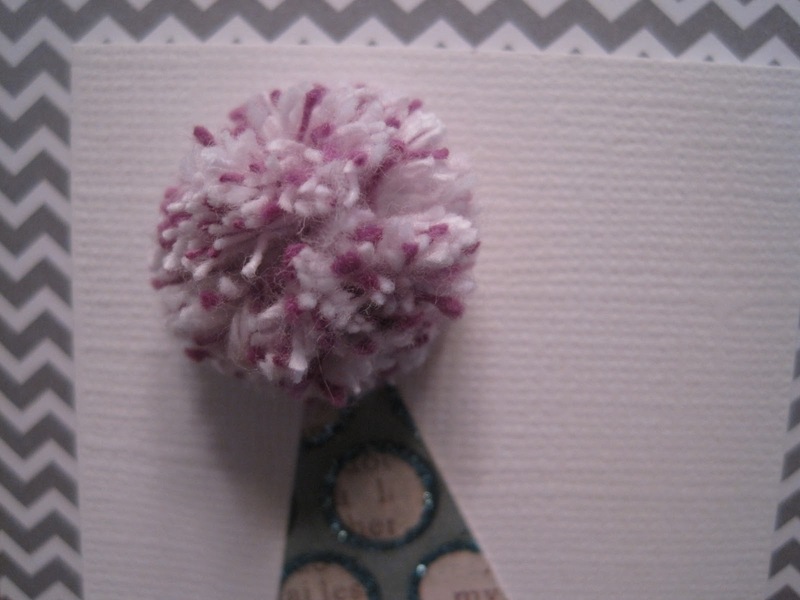 When I went to Impress the other night, they had a sample of these little pom-poms which are made out of Divine Twine. Since I absolutely love twine, what could be better than making little embellishments out of it? 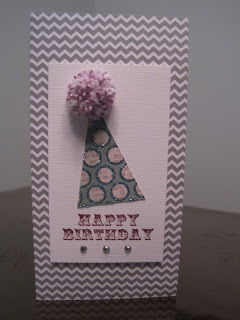 I thought it would be perfect for the top of a party hat for this birthday card. The chevron striped card is also something I picked up the other night....usually I am not one to buy already made cards, mainly because I have a ton of card stock, but I just couldn't pass these guys up! Gonna keep this short, two posts in two days, is a little much after 4 months of nothing! I can't believe that it has been over 4 months since I have posted. 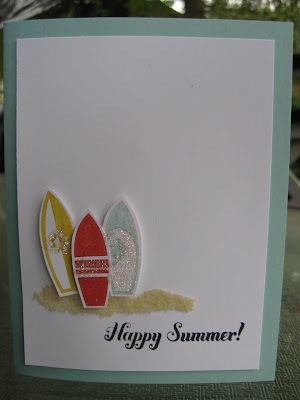 I have also not stamped in about as long.....well, I have done a few little things here and there, mostly out of necessity, but really, for a reason that I am just about to divulge, I have not been stamping. 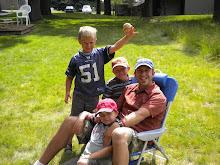 In early September, I found out I was pregnant with my 5th child. Although we knew we wanted another, it was a bit of a shock that it happened when it did. As with all my other pregnancies, I became quite sick, and basically everything in my life with the exception of keeping my family fed and in clean clothes, was put on hold. Even one of the greatest joys in my life: stamping. A few other road blocks came up in November, and then the Holiday and Christmas season hit and I became wrapped up in that. Now it is January, a time to begin fresh, and start anew. I am happy to say that I had a chance to visit one of my favorite little stamping stores last night for the first time since this past summer. It inspired me to stamp again, although I know that I will not be producing as much as I have in past years. Hopefully it will be enough to share some fun things here, if there's anyone out there that still checks in...... I actually stamped tonight, and made a couple of cards....one just for fun, and the other for the current Paper Crafts call. It would be fun to be published again this year! Hopefully the weather will permit me to get outside tomorrow to snap some pics of the cards and I can get one posted here. Hope you all are having a great start to 2012. I am very excited for what this year will bring, mostly because we found out a few weeks ago, that after having 4 boys, BABY #5 is going to be a GIRL!!! 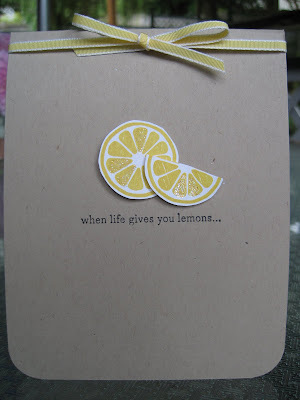 ....or when life gives you lemons.........you make a card for it! I sent this card to someone very close to me who is going through a heartbreaking situation in life. I wanted to send her a card with an uplifting message. And no, it does not say 'make lemonade' on the inside, because, although I do try to look at the positive angles to any situation, and I do believe that everything that happens in our lives happens for a reason, and believe that we become stronger from our trials in life, sometimes you just have to be sad for a while and let the hurt out before you are able to move on. 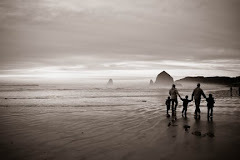 I know God has a plan and a purpose for each of us in this life and that plan involes joy and sorrow. This is how we grow and learn to love, and learn to lean on Him for peace, comfort and the healing of our hearts. I hope that time will heal her sadness, and that she will be happy and joyful again shortly. I mean who doesn't love an elephant in a party hat! It feels like forever since I have taken part in a challenge over at the CAS-ual Fridays blog! This weeks' challenge was to use stickers! I found these little party hat stickers a few months ago, and thought they were just so cute! I think they will work well to make birthday cards for kiddos, which is what this card is for. The last time I went to my favorite stamp store, my oldest son, Cody, asked me if I would get a stamp of an elephant. I saw this stamp and thought it was super cute, so Cody got his wish! t feels good to take part in a challenge once again, and I am hoping that as of Wednesday when the three big boys go back to school, that I will be able to put the baby down for a nap and ignore all the other things I have to do, and make some cards!!!! Yay for fall, yay for school and yay for getting to once again do the things I love on a more regular basis! I cannot believe it has been a month since I have last posted! 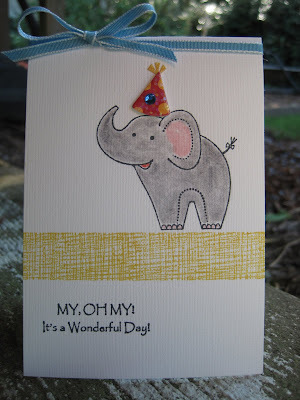 Yes, I am still alive, and yes I am still paper crafting and card making! August was just a crazy month for us. It was one vacation after another, with just a few days in between each one....just enough time for laundry! Here is a card that is basically the same as the last card that was posted. 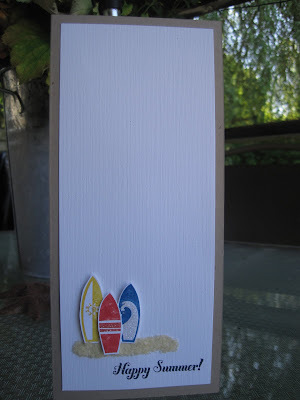 The colors were just changed up a bit and the size was changed to a regular A2 sized card. 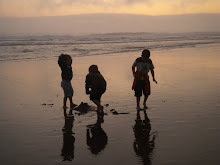 Gonna keep this super short.....the 3 big boys go back to school on Wednesday, and I have a TON of things to do! Oh, What a Happy Summer It Is! I should not be doing this right now. For any number of reasons. But I couldn't help myself! 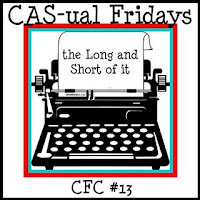 Again, what a super fun challenge over at CAS-ual Fridays. Here is my card. The challenge was to create a 4 x 9 card (which I believe this card to be the first I have ever made) and leave the space open! So tough! But I just made mine super CAS. Almost too much, perhaps! Here is a close up of the image and sentimnet. I received another check from publications the other week, and so I decided to purchase some new stamps and things. One of the things I got is this Sand by Flowersoft. Ooooh, I love it. And I wanted to try it out, so I came up with this card. Gonna Keep this short......I have so much to do........and the baby is sleeping!